After not very satisfying results with Amazon’s Console Application for S3 I started to look for other ways to use my Amazon S3 account and found S3Fox Mozilla Firefox Plug-in. It is one of the few free S3 explorers which are better than Amazon’s console based application but it has some major issues when using it on live sites. S3Fox is Free to use. Installing on Firefox is as simple as few clicks and you don’t have to download or setup anything and Firefox handles it all for you. You can manage multiple S3 accounts very easily. You can transfer complete set of folders and sub-folders in one go (drag drop) and even can synchronize your local folders with S3 folders. It does supports custom headers but this is very limited. If you wish to use Reduced Redundancy storage (RRS) instead of S3 you can do that with the help of custom headers. S3Fox does support custom headers but not the one I was looking for. The main custom header I was looking for was Cache-Control of my image files and I am not sure why but when I add the cache control header. It gives an error: Failed The Request signature we calculated does not match the signature you provided. Check your key and signing method. I tried lot of documentation and other stuff but could not get over this problem. I have tried all possible combination like x-amz-meta-Cache-Control and others but of no use. S3Fox does not have any GUI option for RRS but Supports RRS at custom headers level. 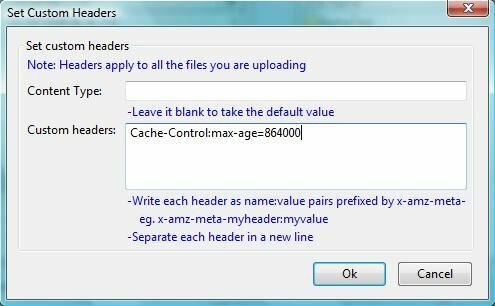 You have to manually enter the following into the custom header each time you upload the file. x-amz-storage-class:REDUCED_REDUNDANCY. Surprisingly this custom header works in S3Fox. Does not have a very detailed documentation for errors and I was not able to solve the error I got for Cache-Control issue. Does not support batch processing. What this means is certain things that needs to be done each time for set of buckets has to be done manually each time you upload your files. It is one of those application which is good to start understanding S3 and Amazon Web Services but not when using it for actual websites. If you have more to share, post in comments below and I will be more than happy to update the list above. Its important to note that the window explicitly states that you must start your headers with “x-amz-meta-“. Modified this to add caching instead and bam it works. But does it actually cache the content? Try browsing through an image or let me know the URL where you have the above header and I can test it for you to see if the caching of that content is working or not.